Fridge is one of the most important kitchen appliances in modern life and technically it is indeed the home for your food. In the other word, it needs to be clean and organized. A neat firge is not only important for your family’s health, but also help to save time, reduce waste and ultimately, save money. However, for many people keep a fridge organized is a challenge. No matter how large the fridge is, we are always so easily to fill it up and make search difficult. If you have the similar problems as me, take some times to check the awesome fridge organizers we picked in this article. With the help of below cool products, you can become a fridge organizing master and you might find your fridge never looks that clean, organized and even spacious. Stop searching for leftovers and snacks in your unorganized refrigerator. Use space that normally goes to waste. 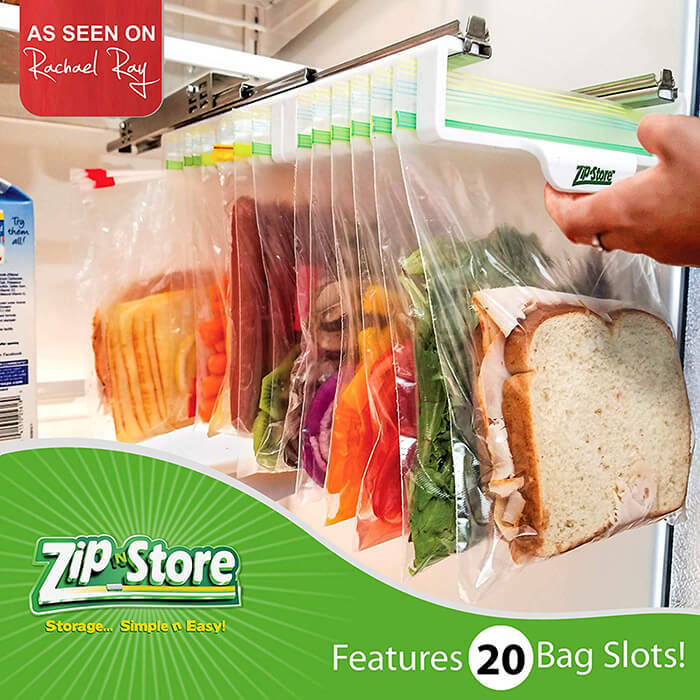 Zip n Store is easy clutter-free organization. It is the best pantry, refrigerator, freezer and under cabinet organizer. ust attach to the bottom of your refrigerator shelf. Peel, stick, and slide. It’s that simple. Zip n Store is also simple to un-mount. Requires a flat underside of your refrigerator shelving with space of 7″ wide by 9.75″ deep with a full depth of 16.75″ in your refrigerator. Food grade PP plastic, BPA free; Strong, Holds up to 33 pounds; Clear design keeps food items visible and easy to locate. L13″ x W8.6″ x H5.1″, Fits most standard size refrigerator from 128L ~ 650L. 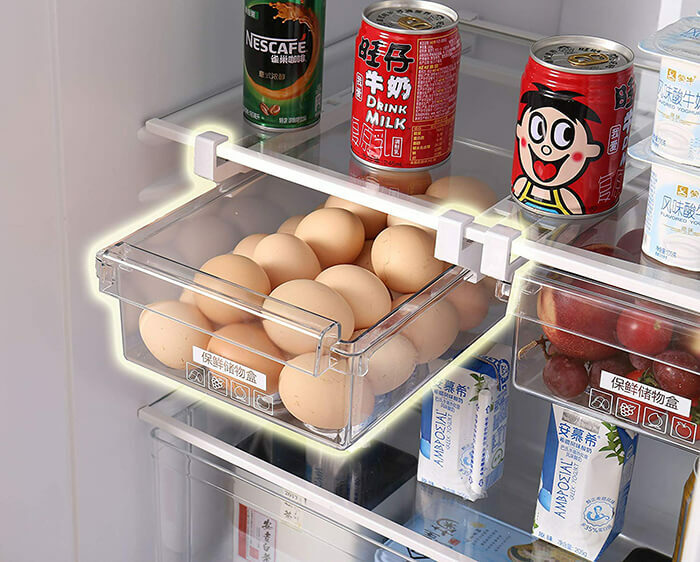 Organize your entire refrigerator and instantly create more space using this patented pull out bin. Fits most standard size refrigerator shelves; measure shelf dimensions for proper fitment. 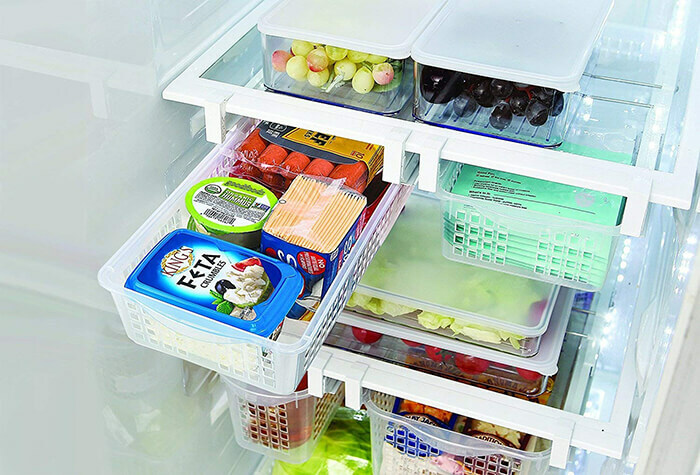 Great for storing food in your refrigerator, organizing clothing in your closet or creating more space in your garage. This food storage container is used for the storage of various kinds of food and vegetables; it offers you an efficient use of space. The container box comes with a tray that you can put in the bottom of the container. This is nice if you have something that will leak or drip so the contents in the tray will not stand in the drippings. 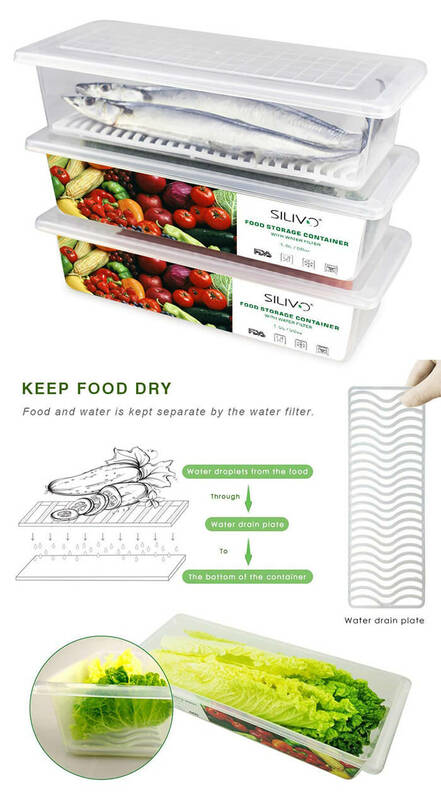 Meat, vegetables, cooked food can be placed in the crisper, to prevent food deterioration, moisture mold, dust and prevent flying insects and so on. 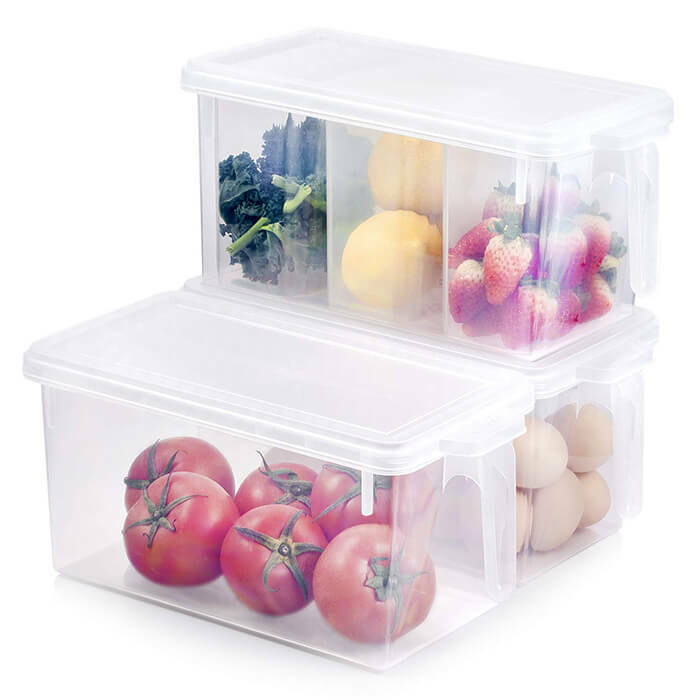 Freezer containers made by long-lasting food grade BPA free plastic, no odor, translucent, ECO friendly, reusable, stackable. Easy access to your stored stuff, help to make your life easy and organized. Kitchen organizer set including 3 big cabinets with lids and 3 removable small bins (inside one big cabinet design). 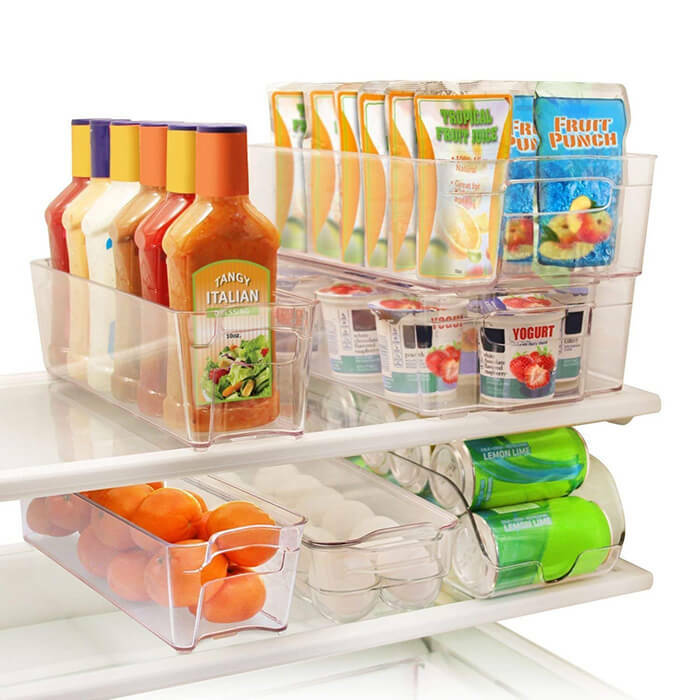 Multiple uses as pantry organizer, kitchen cabinet organizer, refrigerator organizer, freezer storage containers, etc. 3 big cabinets (12”X6.14”X5.75”, 4.5Qt) with handle, easy to grab and take out from fridge or shelf. 3 small cabinets (5.24”X3.11”X5.43”, 1.5 Qt) with easy take out and pour design, perfect for your prep meal, prep salad and prep food. Special design tight lid fastens to the container and easy to open, keep your stuff fresh, no odor mess up. Keep your refrigerator, freezer, pantry neat and organized with this 6 piece stack-able bin set. Made of heavy duty durable BPA free material which won’t crack and break easily. Has built in easy to carry handles. Easy to care, wash with soapy warm water. Do not! use in dishwasher and microwave and do not store warm foods or boiling liquids. Made of sturdy, food safe BPA free plastic, this organizer holds up to 9 cans and has a removable top tray to maximize refrigerator storage space. 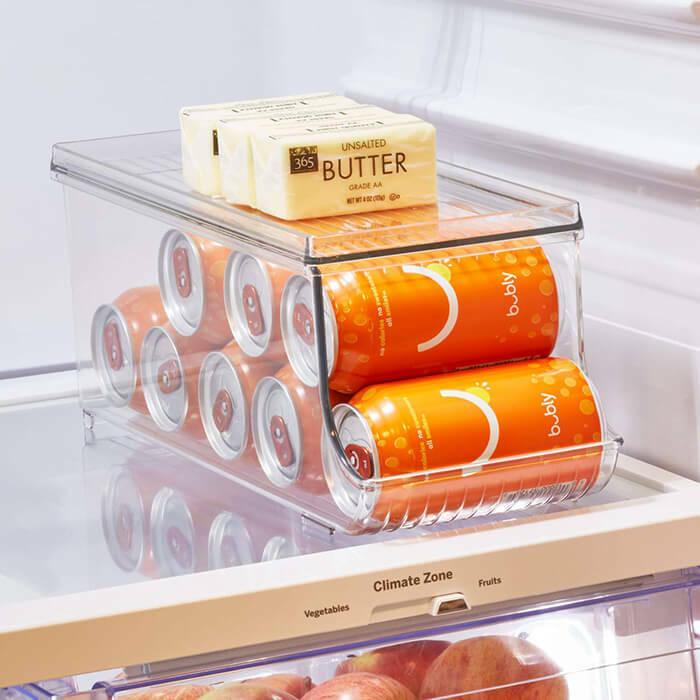 Perfect for soda, beer and pop, the transparent container allows you to see instantly when stocks are low, and the sturdy, compact rack design keeps your cans organized and stored in one place – no more searching the fridge shelves to find one. Practical, simple and easy to clean, simply hand wash the plastic can holder with mild detergent and water – not suitable for dishwashers.